Should the Browns make a run at Baltimore’s Joe Flacco? If Jimmy Haslam, Joe Banner and Rob Chudzinski were not already fully aware of the task before them, Sunday night’s Super Bowl drove the point home for the new Cleveland Browns regime. It wasn’t so much that the Baltimore Ravens won (although that is pretty big) but that the Ravens’ appearance in the Super Bowl illustrated how much of a presence the AFC North has had in the NFL postseason over the past 10-plus years. Starting with Baltimore’s Super Bowl win in 2000, an AFC North team has represented the AFC in the Super Bowl 38 percent of the time. A team from the AFC North has been in the conference championship game 35 percent of the time. Finally, 29 percent of the teams that have made the playoffs in the AFC since 2000 have come from within the Browns’ division. Hopefully that message is getting through in Berea as the Browns begin another off-season of change. And speaking of change, with questions surrounding what the Browns should do with quarterback Brandon Weeden – give him a year in a real NFL offense? Alex Smith anyone? – the chattering has begun for the Browns to do “whatever it takes” to get a quarterback upgrade on the roster for 2013. 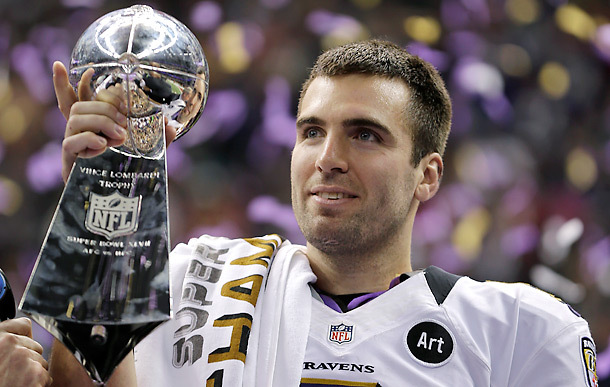 Well, here’s a “whatever it takes” scenario for Browns fans to consider: Joe Flacco. Flacco has nine playoff wins (tying him with Tom Brady for the most in the first five years of his career) and six road playoff wins, an NFL record and something that would seem appealing to a franchise like the Browns that last won a road playoff game in 1969. He’s also younger than Weeden and Smith. The Ravens have a choice to make while they figure out how to resign Flacco now that his rookie contract has expired. If they can’t work out a long-term deal with him (think Drew Brees money) they can use the exclusive franchise tag on him, which would pay Flacco more than $20 million for next season according to some reports. Or they could use the non-exclusive tag (to the tune of about $14.6 million in salary) and hope that a team that needs a quarterback and has cap space won’t try to sign Flacco. The first option seems unlikely as the Ravens have numerous free agent headaches to deal with this off-season in addition to Flacco – most notably linebacker Paul Kruger and corner back Cary Williams – and to give Flacco that much money would make life difficult for Newsome. Plus the Ravens are projected to have only about $15 million in salary cap space for 2013 – or maybe even less than that. But the second option is just as dicey. Former Browns general manager Tom Heckert (the guy that Banner said made the team better than it was, but who had to go so the Browns could hire Mike Lombardi) left the Browns a lovely parting gift when he was shown the door – more than $45 million in cap space. That pile of cash would allow Banner to conceivably put together an offer for Flacco that would be very, very difficult for the Ravens to match. In addition to the salary, it would cost the Browns two No. 1 draft picks if they signed Flacco away from Baltimore. So while the Browns would be getting a clear upgrade at the quarterback position, they would also be handing a division rival two first-round picks that, deep down in their hearts, Browns fans know Newsome will turn into gold in the draft. What do you say, Browns fans? Is that a “whatever it takes” price worth paying? Bingo. If it was a team not in the division I’d be interested in the Browns at least thinking about making a move for Flacco, but turning over draft picks to Baltimore is probably too much. Plus Flacco’s probably not going anywhere. With Lewis retiring and Ed Reed probably moving on, the Ravens are now Flacco’s team and he’s not going to want to give that up. They’re going to figure something out. I think the best choice would be to make Baltimore pay Flacco the max amount and try to steal either Kruger or Williams out from under them. I would definitely be very interested in the Browns taking a close look at both of them.